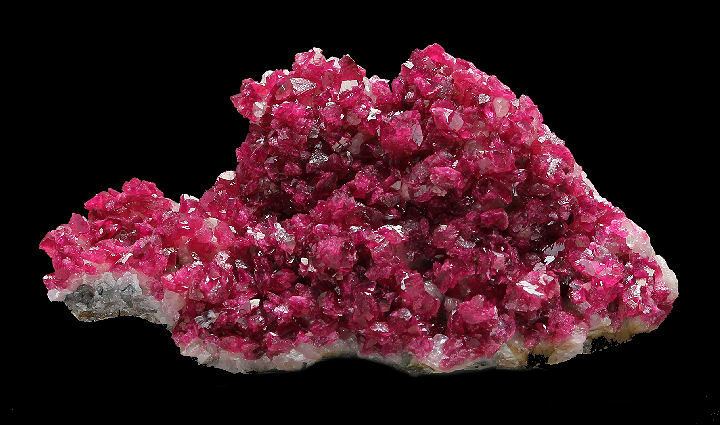 Check out the mineral specimens on this page: Hematinic Quartz Crystals on Hematite Rosettes, Fluorite Crystals on Quartz, Calcite with Hematite Inclusions, Quartz var. Amethyst on Quartz with Calcite, Blue Barite on Limonite, Fluorite Crystal Cluster, Sphalerite with Quartz on Dolomite, Azurite with Malachite, Calcite Crystals on Matrix, Stibnite, Chalcedony Stalagmite, Pyromorphite, Quartz with Hematite Inclusions & Dolomite, Stilbite Crystals on Chalcedony, Wavellite, Herkimer Diamond Crystal Cluster, Calcite Crystal on Calcite, Cuprian Adamite, Pyrite, Quartz Crystals with Fuchsite Inclusions, Roselite, Wulfenite, Rose Quartz on Quartz and Sphalerite var. Cleophane with Quartz, Galena & Chalcopyrite. 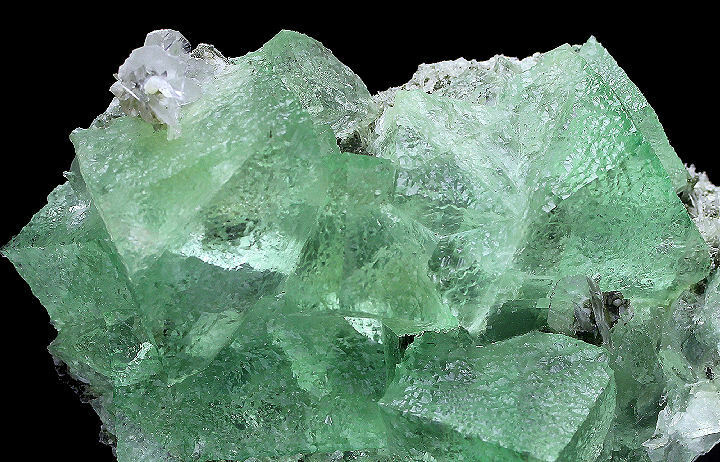 Almost water clear, gorgeous light green cubes of Fluorite with textured surfaces on matrix. An accenting little group of Calcite crystals at the upper left corner. Pristine condition. 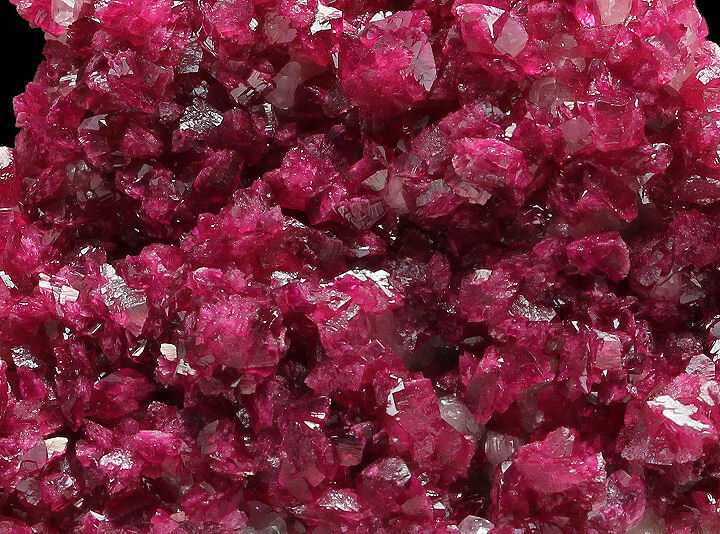 Rich coverage of intense, sharp crystals of Roselite with stunning, intense color saturation and sparkle. From a small find in the Fall of 2013. Lustrous cluster of Hematinic Calcite crystals with rose phantoms and dark terminations. In very good condition. Very nice specimen of jackstraw clustering of Hematinic Quartz crystals on rosettes of Hematite. In very good condition and presentable from both sides. 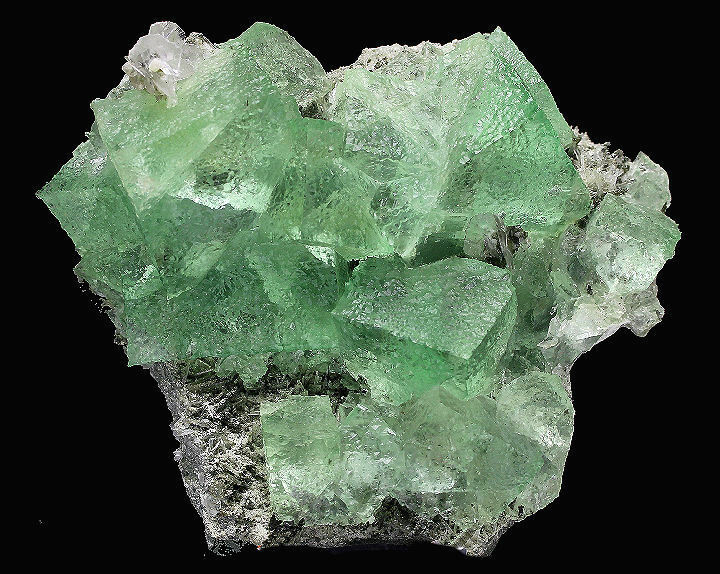 Light green crystals of Fluorite on a Quartz plate. Very pretty and in fine codition. Interesting plate of Quartz crystals some of which have partially evolved into dark blue Amethyst. There is also a scattering of white Calcite crystals. In very good condition. Beautiful light lavender Fluorite crystals with dark edges and purple spots. Nice luster and in fine condition. Excelllent cluster of Sphalerite crystals with minor Quartz and aesthetically perched on Dolomite. In fine condition. Very nice example of the new finds of Azurite with Malachite in Laos. A gemmy Calcite crystal measuring 2.5x2x1.5 cm surrounded by smaller equally gemmy Calcites. In fine condition. Lustrous cluster of Stibnite crystals. The projecting side crystal exhibits a slight, rare bend. Glittering, snow white, stalagmatic formation of Chalcedony. Even better in person. A very aesthetic and excellent specimen of lustrous, rich apple green Pyromorphite prisms with hoppered terminations forming a rich and sculptural rollimg solid crust. The crystals reach about 1.3 cm. Pristine with only trivial perifery wear. Hematinic Quartz crystals with an upper trim of off white Dolomite rhombs. Stalagmatic formation of Chalcedony with aesthetic placement of dark orange Stilbite bowties. A nice specimen of green Fluorite with dark centers on Calcite from new finds in China. Amethyst crystals on matrix from Las Vigas. Even better in person. Rich mint green, moderately lustrous and translucent Wavellite botryoids, measuring to 1.3 cm, covering a sculptural chert matrix. Broken spheres on the edges reveal radial growth of the botryoids. Excellent, complex cluster of glassy and gemmy Herkimer Diamond. No repairs and in fine condition. Light golden to caramel colored cluster of gemmy Calcite crystals (5x4 cm), with a crown of clear, glassy Calcite crystals, nestled inside a vuggy matrix of milky white Calcite. Interesting combo of three generations of Calcite. Beautiful burst of large Amethyst crystals from the Anahi Mine in Bolivia. Very nice specimen of gemmy, green Cuprian Adamite crystals on Limonite. Lustrous plate of silvery to golden Pyrite crystals. Fine example of Quartz crystals with green Fuchsite inclusions. In excellent condition. One of the best we have seen. A Wulfenite specimen from a very recent fnd at the Ojuela Mine. This occurance is notable for the layered, sandwich like appearance of the crystals. Crystals have a dark core, with lighter colored epitaxial growth of later generation Wulfenite on both sides. Lustrous, translucent, pink crystals of Rose Quartz (to 2 cm) forming a lovely wreath around a slightly smoky Quartz crystal. Very nice specimen of gemmy dark yellow crystals of Sphalerite var. Cleophane on a plate of Quartz with Galena and Chalcopyrite. In excellent condition.